In addition to sharing, commenting on, and liking your Page updates, Facebook users can post their own updates on your Page and tag photos from your Page, provided that you’ve configured it to allow fans to do so. Facebook users can also mention your Page in updates, even if they’ve never liked your Page or engaged with any of the content on your Page. All of this means increased exposure for your business among the members of your Facebook community and their friends. How does all of this happen on Facebook? When Facebook users take any action related to your Page, it creates a story in the News Feeds of their friends. Think of it as social word-of-mouth marketing. 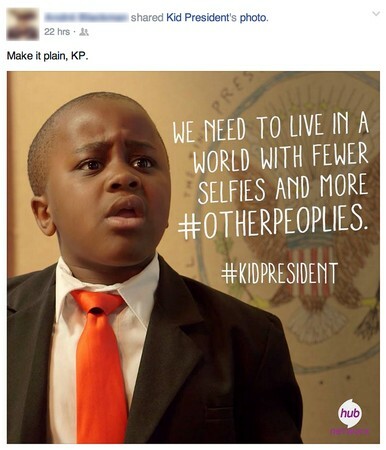 Tagging the Kid President’s Page so that friends see it in their News Feeds. If you choose not to allow fans to share content on your Facebook Page or to tag photos, you limit the extent to which fans can connect with you on Facebook, and you also squelch the natural word-of-mouth power that Facebook has. Log in to Facebook and go to your Facebook Page. Click Settings on the admin navigation bar at the top of your Page. On the General tab, select the Visitor Post option and then click Save Changes to save this selection. On the General tab, select the Tagging Ability option and then click Save Changes to save this selection. Enabling visitor posting for your Facebook Page. If your business is new to social media marketing, allowing anyone on Facebook to post content on your Page may seem scary. This feeling is understandable but often unwarranted. You’ll find that engaging criticism directly on your Facebook Page creates a positive image for your brand. Of course, you’ll have to make the decision of whether to allow fans to post content based on your own circumstances. During the 2012 presidential election, neither Barack Obama nor Mitt Romney allowed Facebook users to post content on his Page. From a strategic standpoint, this made sense, allowing each candidate to keep tight control of his social media messaging all the way up to Election Day. You’re probably not planning to run for President, but in some rare instances, keeping tight control of your messaging makes sense.